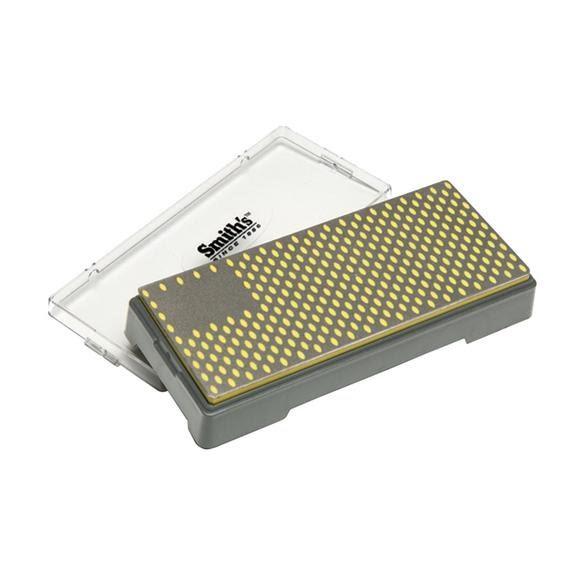 Smith's 6 inch x 2.5 inch Diamond Bench Stone-Coarse features multiple layers of micron-sized moncrystalline diamonds bonded in nickel to a flat metal surface. The unique overlapping oval hole design speeds sharpening by collecting and holding the metal filings which ordinarily build up during the sharpening process. Smith&apos;s 6 inch x 2.5 inch Diamond Bench Stone-Coarse features multiple layers of micron-sized moncrystalline diamonds bonded in nickel to a flat metal surface. The unique overlapping oval hole design speeds sharpening by collecting and holding the metal filings which ordinarily build up during the sharpening process. This allows the sharpening surface to remain clean and clear and speeds sharpening. This stone is excellent for sharpening side woodworking tools, medium to small sport/utility knives, or kitchen knives.